Civil Rights Association warns of 'heavy suspicion' that Duma arson investigation is breaking law, after lawyers reveal brutal torture. The Association for Civil Rights in Israel (ACRI) responded with shock on Thursday night, after the lawyers of the Jewish suspects being investigated in the lethal Duma arson revealed the brutal torture they are being subjected to by the Israeli Security Agency (ISA). After finally being able to see their clients - in some cases 21 days after they were arrested - the lawyers learned from them of the torture that included sleep deprivation for days, the beating of a minor's sensitive organs until he could not feel kicks and slaps, and one suspect whose head was pulled backwards until he violently vomited. ACRI called on the Justice Ministry, which is headed by Justice Minister Ayelet Shaked (Jewish Home), to investigate whether the investigators are breaching the law. 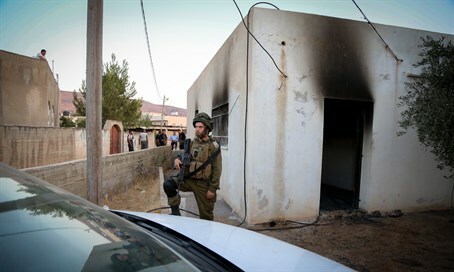 "The report from the lawyers of the suspects in the terror act in Duma village regarding their investigation by Shabak (ISA) raises a heavy suspicion of illegal investigation methods, such as using physical force and preventing sleep for long hours," said ACRI in a statement. The ACRI noted that these investigation means of using torture were outlawed by the High Court following a petition submitted by the ACRI itself, together with the Public Committee Against Torture in Israel and the Center for the Defense of the Individual. That petition was based among other things on the reports of the radical leftist group B'tselem. "We call on the supervisor of the Justice Ministry to immediately launch an investigation of the complaints," added the ACRI, indicating Minister Shaked. Both Internal Security Minister Gilad Erdan (Likud) and Defense Minister Moshe Ya'alon (Likud) have admitted there is no evidence against the suspects to stand them on trial, raising fears that the brutal investigation is meant to force the suspects to make false confessions.